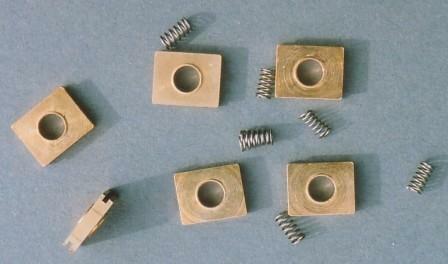 1/8" or 3mm bore sprung hornblock, with coil springs to slide in frame or hornguide slots of nominal 6mm width. 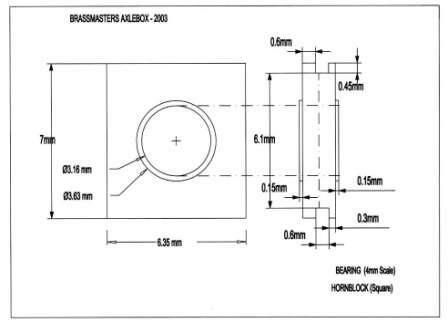 The transverse width of the slot in the hornblock is 0.6mm, and thus will be suitable for frame or hornguide thicknesses up to 20 thou (0.5mm). Metal thickness in most etched kit chassis framework is nominally 18 thou (0.45mm), so these hornblocks are ideally suited. Note the transverse asymmetry of the hornblock slot, a feature that can be exploited to control or alleviate wheelset sideplay in critical situations.